There are times as a nurse when you get the distinct impression your patient does not like you. On a labor and delivery floor, this is often the case as I tell my patient that we are going to deviate from “the plan.” It is as if I knifed her birthing ball while setting fire to her her birth plan. The accusation in her eyes is no less. As a nurse, I often feel myself torn by the contradiction of my own views. I am a labor and delivery nurse and I work in a hospital setting that employs many of the interventions these women are rebelling against. Yet, I am a proponent of letting a women’s body guide the labor experience. I support midwives and homebirths. I even started a graduate program to become a midwife before life with children changed EVERYTHING; that is a whole separate blog post. 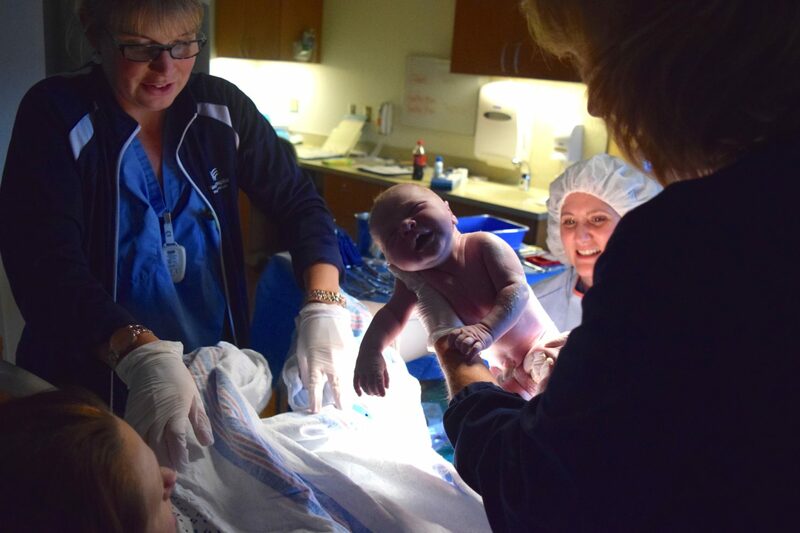 The natural childbirth scene has a new tendency to vilify nurses. The general gist is that nurses are pushy know-it-alls who in fact know nothing about childbirth and the healthy newborn. Sure, we may be able to save your bacon if things do not go as planned but when the well oiled machine of natural childbirth is chugging away, nurses just want to get there grubby paws all over it and muck up the works. I get it. We are in an age that has stepped away from labor and breastfeeding as natural states of being and attempt to methodically manage them the same way we do diseases. More and more research supports less intervention as the best approach. While I applaud mothers trying to become more educated about childbirth and taking that initiative to advocate for the rights of their body and their baby, I ask that perhaps everyone stops and takes a look at the bigger picture before pointing fingers. 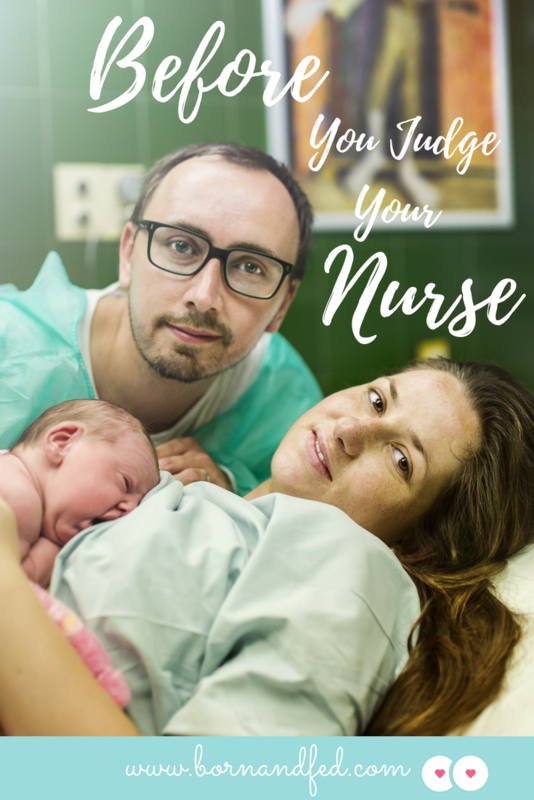 Before you judge your nurse too harshly, ask yourself what are her motives. 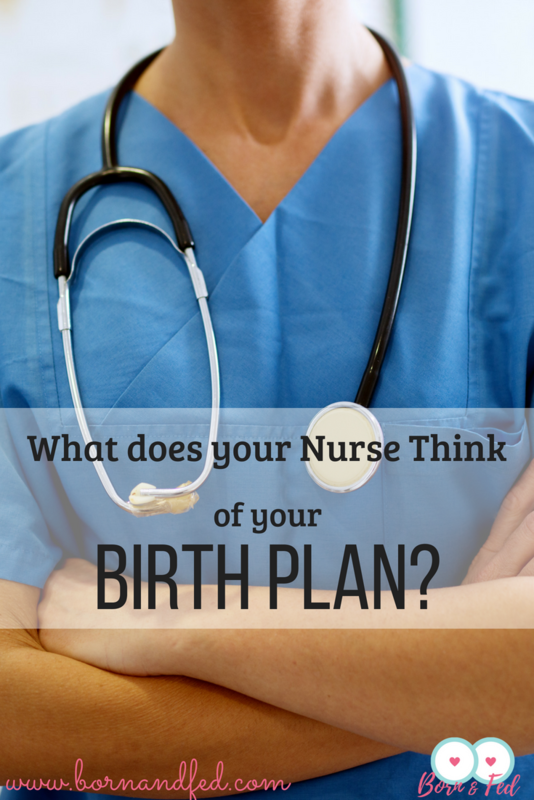 Is her goal in life really to boss you around and stomp all over your birth plan? I think not. You have to be a little bit twisted to be a nurse. Why else would you agree to be elbow deep in blood, feces, and God knows what else for 12 straight hours? The raucous conversations emanating from an average nurses lounge would make a sailor blush. But don’t mistake our morbid sense of humor for lack of heart. Long hours, thankless backbreaking work, and unhappy endings harden us. We encapsulate ourselves so we may come to work and do our job to the best of our abilities. Our bad days are literally ultimatums of life or death. We have held dead babies in our hands and wept over the injustice of their short little lives. Nurses looked into the eyes of a mother when we confirm that there is indeed no heartbeat. There are days we stand at the bedside of women who do not make it home to learn what it means to be a mother. Some days we save lives and other days we can only stand vigil. It’s the morbid type A personality in all nurses that has us coming back for more. The horrendous does not scare us off. We wear our experiences like armor so we can be prepared for the next train wreck that walks through our door. There is often little glory in the drudgery of our job. We receive specialized degrees so we can clear dishes, make beds, and scrub blood off toilets. There are days that seem so long that we laugh to keep the tears at bay. Forgive us our inappropriate sense of humor, our often-pushy demeanor, and our sometimes-inflexible nature. We push because we care. We seem rushed because we are. At times we seem insensitive because we have seen true misfortune and it is often in the next room. That miniscule percent of people who suffer from a birth emergency are a reality to us. We have seen the ruthless consequences when things go badly. It happens in the blink of an eye. We may understand that labor is a beautiful natural process but the pervasive aroma of tragedy follows us like a cloud foreshadowing its inevitable return. I have never met a nurse who decided to work at your bedside for the money. We all answered the call because we wanted to help people. The reality of bedside nursing is often grittier than we imagined as starry-eyed graduates. There is more blood, more tears, and more poop than any of us could have imagined. Yet, we keep coming back for more. We are products of our world. It is fast paced, it is unforgiving, and yet it can be beautiful. Being a labor and delivery nurse is not just about handing parents squishy new babies; even if that is our goal. When we yell “PUSH” as you think you cannot possibly survive one more contraction, when we advocate for interventions that are outside your birth plan, or when we seem be less fluffy than the maternity nurse you imagined; remember that our hearts are centered on helping you bring your baby safely into this world. Behind that wicked sense of humor and sometime rigid personality is a person who believes in helping people. 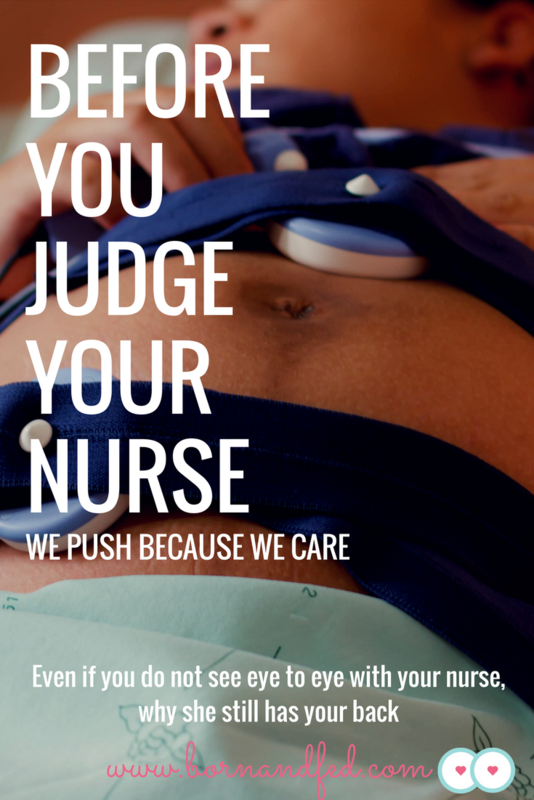 We nurses are pushing you so we can hand you a vernix smeared baby and let you snuggle skin to skin. Nurses push you so you can have the opportunity to exclusively breastfeed your baby. We are pushing you so you and your baby have the opportunity to live your lives together. We know that is not a guarantee. So instead of bashing nurses, perhaps we can thank them for seeing the worst and still coming back each day and pushing for new happy beginnings. Great post, Jess! I was one of those people w/ a strictly ‘no intervention’ plan (typed up, in a folder, with duplicates for all involved- lol.) I, of course, ended up w/ every intervention in the book and a crash cesarean 4 week’s before dd. Archer and my survival is 100% due to the nurse that was caring for us. She had been telling the doctor to get an internal fetal monitor in for at least a day (at this point I had been in the hospital for 5 days and had given up resisting anything suggested.) The moment the doctor reluctantly gave in to her suggestions, she saw the distress the nurse was suspecting and I was rushed to the OR. I think about this nurse all the time and am so grateful she was the one caring for us and followed her instincts. Wow!! Great job in writing this!!!! Thank you Deanna! I really appreciate it! I worked in L&D for 12 years. Initially I felt that nurse that teaching patients was an important part. At the hospital I worked at was treating Clinic & Private MD patients. Some patients varied no education & to couples with birthing plans. No labor or delivery is ideal no matter what plans are in place. I enjoyed my job for many years but it took a toll on me also and after change of labor,delivery & recovery suites came about . It was time to change in all my years I had one maternal death. The baby lived by nothing could be done for the Mom. Also fetal deaths whether early or late in pregnancy is extremely difficult. I hope that I had a positive experience on these many people. Wow Jessie! That was awesome. We do have a sick sense of humor, don’t we? Great read Jess 🙂 looking forward to more posts!